Happy Memorial Day weekend folks! 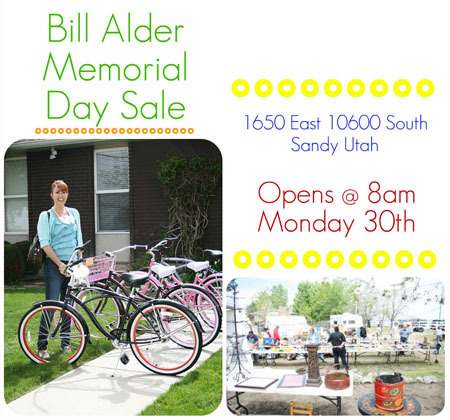 Bill Alder collects antiques and orders in from China for an entire year and then has a HUGE garage sale every Memorial Day Weekend, Friday, Saturday and Monday. It opens at 8:00. His address is 1650 East 10600 South in Sandy. It is on the south side of the road and you can park in the lot east of his house or the dirt area to the North of his house. He doesn't have a website or anything like that to refer to but it is a sale worth checkin' out! The other awesome sale that is going on, I believe at ALL stores, for the next few days, is the DownEast Tent Event Sale! We ALL know how much I love them, right!? With their name brand prices, such as Pottery Barn, Restoration hardware, and JCrew, for about a quarter of the price ... their stores are a no brain-er for me. That's where we got our couch, coffee table, mirror, and more! Jen picked up a coat for $5.00, and I snagged a tall, mini white hutch for $100.00. 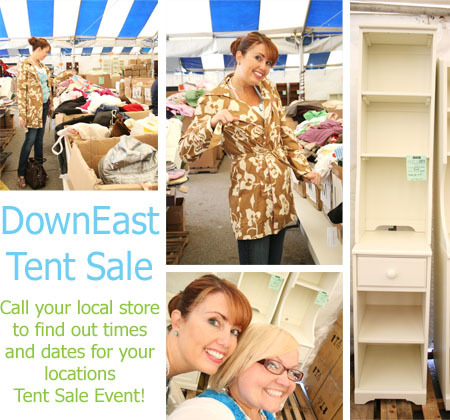 I actually found out about the tent sale through following DownEast on twitter. They always post their sales and great new arrival furniture on there under: @DownEastHome. Alright, now that you're clued in on all of my shoppin' hot spots, this Memorial Day, get out there and find some great stuff! so does that mean that each downEast store has their own test sale? I live by the one in the District. Is there a tent there? I want to get in on those great deals! Thanks for the info! Hoping I can make it to at least one--if not both--of these sales! Shelley! you should have blogged about this early. I totally would have been there on Friday at 8! Oh Well, I will try to remember for next year. Thanks for letting me know. I see his sale every year going my mom's house and my dad's grave. I need to stop one of these years! There are ALWAYS a ton of people are cars there. Does this garage sale still happen every year? I know this is an old post but I'd love to go check it out this year!